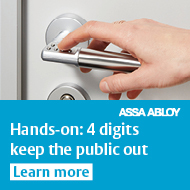 Critical infrastructure requires locks that are proven, tested and trusted. Sometimes electronic locking is the right choice; at other times, mechanical locking does the job. With CLIQ® mechatronic locking technology, one water utility combined both in a single, secure system controlled by powerful, intuitive CLIQ® software. O des Aravis is responsible for water capture, storage quality, analysis and delivery of around 700,000m3 annually to homes and businesses in the Aravis Mountains region of France. PROTEC2 CLIQ® key-based access control with programmable, battery-powered keys now secures 30 opening points across their premises. These robust locking devices are suited to protecting high-security openings, including a potentially dangerous room with high-tension electrical cabling and equipment. They are already deployed at critical infrastructure sites all over Europe. The mechatronic CLIQ® system enables the utility’s facility managers to control, modify and trace every important access. They know who goes where, and when. They are aware of activity affecting all critical doors; it is even impossible to leave one unlocked. Because CLIQ® is a flexible, key-based system, O des Aravis can also retain some mechanical locks at the site, operated by the same secure keys and with the same PROTEC2 high-security disc cylinders. CLIQ® software makes it easy and intuitive for O des Aravis to manage their entire locking system. “The programming software platform is very simple to use. We can easily grant or forbid access rights to any user,” explains Laurent Schutz, Water and Sanitation Process Manager. The CLIQ® Web Manager software is built to help companies like O des Aravis manage complex workflows. System administrators can program, amend or delete keys remotely. It’s straightforward to generate time-stamped audit trails for any lock or key, to track access in detail. The Web Manager can generate attendance reports for staff and contractors. Yet despite all these features, the CLIQ® Web Manager requires minimal IT investment: it runs in the cloud and is accessed via an encrypted connection to a standard web browser. At O des Aravis, comprehensive audit trails for any lock or key are available on demand. These also sync automatically when a user key is updated or revalidated. If a key is lost, a security manager can deactivate it instantly with a couple of clicks, ensuring buildings and clean water supplies are not put at risk. We live in a world of diverse threats to our critical infrastructure. For Aravis Mountains residents, winter skiers and summer hikers, these refreshing alpine waters are safely locked down — thanks to CLIQ® wireless access control.